DAVID WILSON NORTH WEST STAFF WALK, RUN AND SWIM NEARLY 2000 MILES FOR ALDER HEY CHILDREN’S CHARITY – Our Space, Your Place. Staff at David Wilson Homes North West will travel a total of 1859 miles this year in 110 combined activities, to raise money and awareness for Alder Hey Children’s Charity. 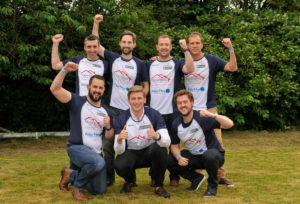 The leading home builder’s dedicated staff are taking part in challenges across the North West including running, cycling, swimming and even wing-walking to raise money for their chosen charity this year. Alder Hey Children’s Charity raises vital funds to help make a world-class, patient-friendly hospital for the 275,000 patients and families that they care for every year. The hospital conducts pioneering research for new medicines and treatments that will provide the best care for those in need. Last year, David Wilson North West raised £33,500 for Alder Hey Children’s Charity and this year they are hoping to exceed that target. 33 staff members in total across the Warrington based division will be participating in the gruelling challenges with individuals completing as many as nine activities each. Steve Jackson, Sales Director at David Wilson North West – who is also participating in six challenges himself said, “The staff at David Wilson North West are fantastic for getting stuck in to such difficult activities but for such a worthy cause. Some of the challenges being undertaken include the Coinston Challenge which totals 18.6 miles of trekking, cycling and kayaking. Alongside this, staff members will complete the Manchester Half Marathon and a Liverpool to Chester bike ride. Jason Corner, Land Director for David Wilson Homes is also cycling the Lands’ End to John O’Groats route, totalling 677 miles. Copyright 2017 Mike Sewell (tel: 07966 417114) Photograph by Mikey Sewell. David Wilson Homes North West end of financial year staff bbq at The Farmers Arms in Warrington. David Wilson Homes are building at developments across the North West. For more information on any other the developments please visit the website at www.dwh.co.uk or alternatively, please call the sales hotline on 08448 11 3366.